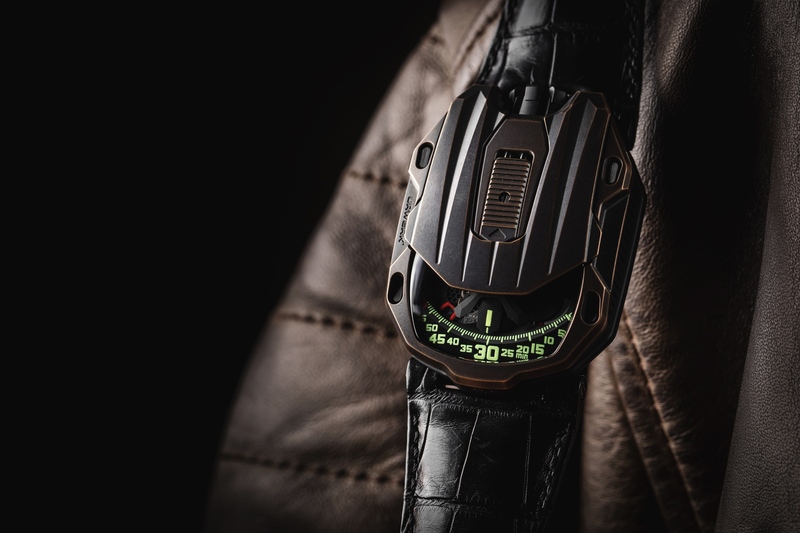 Urwerk’s latest timepiece – introduced last month at SIHH – is the UR-105 CT Maverick, a new version of their wandering-hour watch, clad in a rugged looking combination of dark bronze and black titanium. The Maverick’s unique two-tone construction allows you to enjoy the look of bronze on the front (bezel), without the typical weight thanks to the ultra-light titanium back (case and caseback). 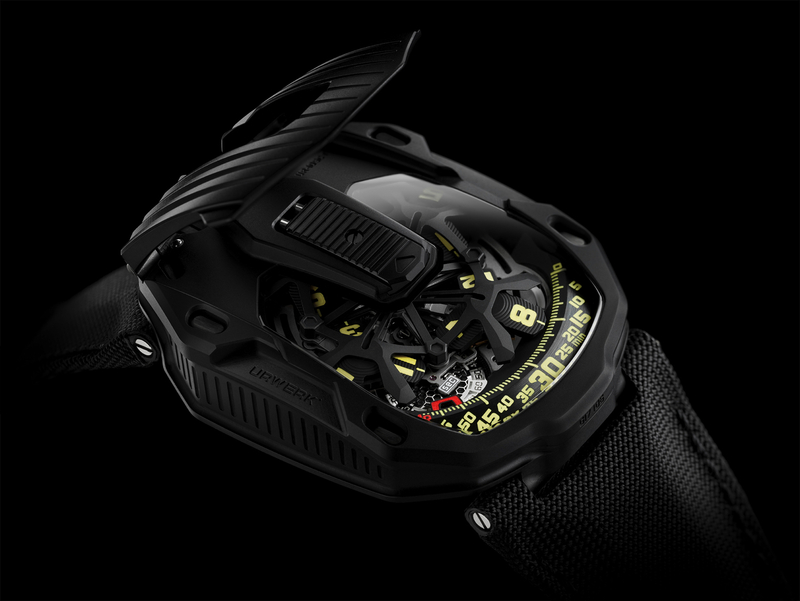 Urwerk’s wandering-hours complication consists of the hour numerals turnings along a track of minutes. Four satellites, each holding three-hour numerals are mounted on an aluminum open-worked rotating carousel. The hours are thus indicated by Arabic numerals, and the minute mark underneath is the current minute, giving you the time. The seconds are indicated digitally, within the red aperture, and impressively, seconds are displayed down to a tenth of a second. A crescent-shaped power-reserve indicator, on the dial side, tells you how much of the 48-hour power reserve is remaining. 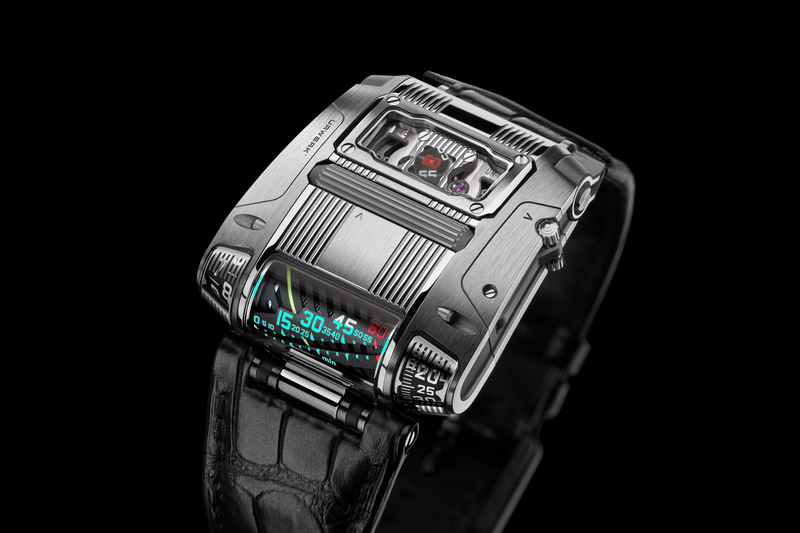 Driving the indications is caliber UR 5.03 which operates at 4Hz and features a self-winding system governed by twin turbines, with 52 jewels, and a 48-hour power reserve. The baseplate is made of ARCAP, which is a metal alloy that doesn’t contain iron, so it’s not magnetic and does not corrode. To see inside of the movement you have to slide the tab on the top of the case. Finishing of the mechanical components includes circular graining, sanding, brushing, and chamfered screw heads. On the back, the two turbines which govern the automatic winding system are adjusted by a lever. In the FULL position, the slightest movement activates the winding rotor. Turn the lever to the RED (reduced) position and the turbines dampen the winding action to avoid too much tension on the mainspring. In the STOP position, the automatic winding is disengaged and the watch can be wound manually by the crown. 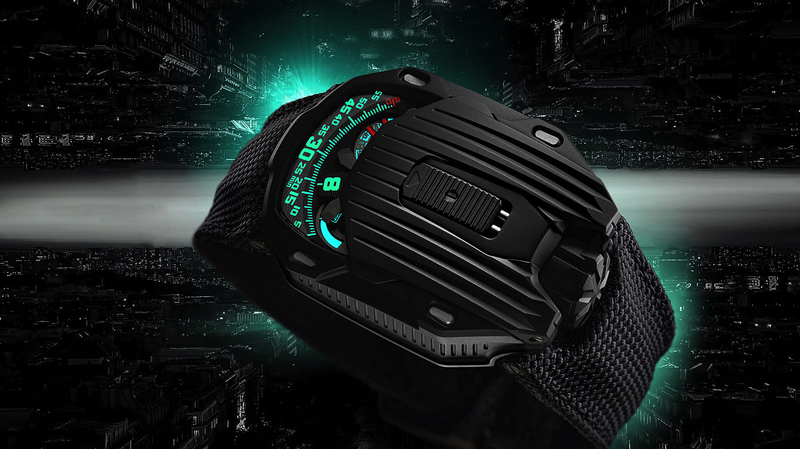 The UR-105 CT Maverick measures 39.50 mm x 53 mm x 16.80 mm and is water-resistance to 30 meters. Limited to 22 pieces. Retail is $69,000. Previous articleEditorialWhy do some watch companies choose such complex names?